I would like more information about 4312 North Franklinia Street. This stunning 3BR/2BA saltwater pool home in The King and the Bear is right out of the pages of The Magnolia Journal, with an open living floor plan that is truly family and entertaining driven! It begins with the formal living and dining room that are perfect for entertaining guests, flowing into a large kitchen with stainless appliances and granite counter tops. The central over sized kitchen island has a high seat bar and workstation as well as a coffee bar that overlooks the breakfast nook. Addnl Marketing Remarks: The comfortable family room is perfect for relaxing with a fireplace and tons of gorgeous natural light opening out to the patio. The Wonderful covered porch right off family room leads into the fully screened pool area, and allows you to take family life outdoors throughout the year. The Large Master Suite opens out onto the patio with double french doors, and features a large over sized bathroom with garden tub, and walk in closet. 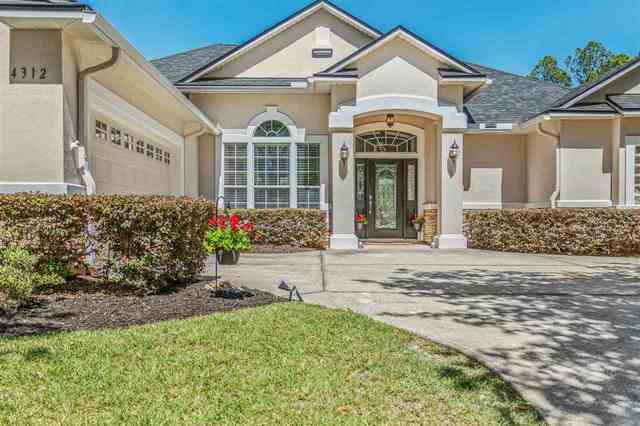 This home is the last house on the cul de sac in a gated well established community and has a wonderful lot with a fenced back yard and extra privacy. Did we mention the Huge 2.5 Car garage that will hold all of your toys including your golf cart? Neighborhood Amenities include brand new gym, heated pool, clubhouse, restaurant, and world renowned golf course. New roof was just installed in September 2018. You will fall in love with this home. Make an appointment to see before its gone! Directions: I-95 to International Golf Pkwy. W to King & Bear. Wildwood is 3 miles past the guard gate. Left on Courdoroy to Franklinia.